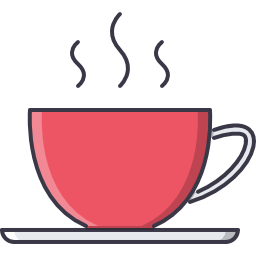 Home » General Interest » Coffee – The Revolutionary’s Drink of Choice ? Coffee – The Revolutionary’s Drink of Choice ? Did you grab a cup of coffee on your way to work this morning, or drop in to a coffee shop with a friend to gossip whilst savouring the bitter sweet nectar of the that king of all beans the coffee berry ? If you’d done this in the 17th Century then you might have been regarded as either a subversive or a danger to the moral fabric of society. Clearly we need to explain. Although we British are better known for sipping tea rather than coffee, it still played a major part in British (or certainly English) history as well. London’s first coffee house opened in 1652 as the nation was recovering from a civil war. Balkan-born Pasqua Rosee began selling his brew after coming across the drink on his travels in the eastern Mediterranean. It was an immediate success. Within a few years, Rosee was reportedly selling more than 600 coffees a day. Copycat ventures appeared across the city. By 1656 another coffeehouse opened on Fleet Street. Over the next few decades, hundreds more would spring up. The exact origins of coffee are murky, but most agree that it came from Ethiopia. Tradition says that a goat herder named Kaldi discovered coffee in the 9th century. (you can read more about this in our article “Coffee – buzzy, frothy goodness“) By the 16th century coffee drinking could be found in Persia, Egypt, Syria, and Turkey. Coffeehouses began to appear in cities across the Middle East. The popularity of the coffee houses was unequalled and people frequented them for all kinds of social activity. So it was that in the 17th century coffee finally began to spread to western Europe, first appearing in Amsterdam and Venice. England was still reeling from the Civil War (1642-1651) when London’s first coffee shop opened. After the beheading of King Charles I and the replacement of the monarchy with the Commonwealth, coffee’s sobering effects were perfect for the puritan spirit of the time. Unlike ale or spirits, drinking coffee increased lucidity and concentration. No alcohol was served in the coffee houses, nor were women present. “COFFEE-HOUSES … have produced very evil and dangerous effects … many Tradesmen and others, do therein mis-spend much of their time, which might … otherwise be imployed in and about their Lawful Callings and Affairs; but also, for that in such houses, and by occasion of the meetings of such persons therein, divers False, Malitious and Scandalous Reports are devised and spread abroad, to the Defamation of his Majesties Government … his Majesty hath thought it fit and necessary, that the said Coffee-houses be … put down and suppressed, and doth . 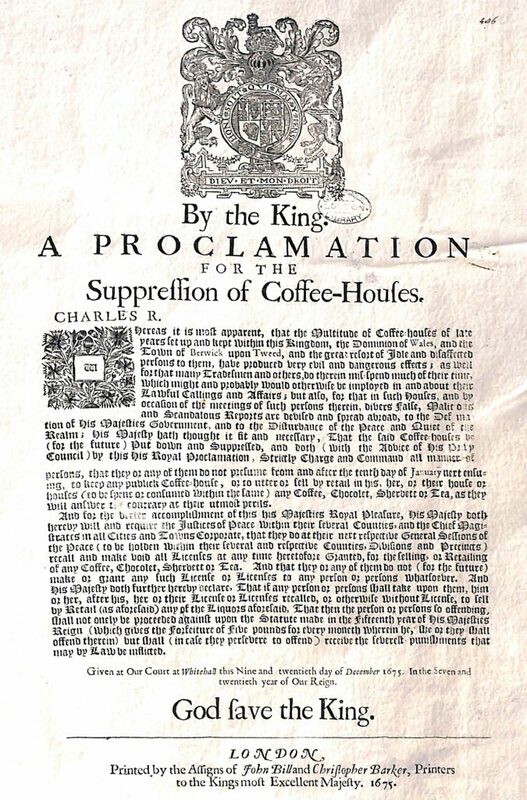 . . Command all manner of persons, that they or any of them do not presume … to keep any publick Coffee-house, or to utter or sell by retail … any Coffee, Chocolet, Sherbett or Tea …” PROCLAMATION FOR THE SUPPRESSION OF COFFEEHOUSES ISSUED BY KING CHARLES II OF ENGLAND 1675. Patrons of London’s coffee shops typically sat at long wooden tables with shared candles, pipes , and newspapers. These communal items gave a marked democratic character to many establishments. and men of different social classes could meet and discuss the issues of the day-including’. politics . We would say now that Coffee and coffee houses environment were truly a part of the zeitgeist of that age. Some coffee shops attracted poets and wits. Scientists from the Royal Society even conducted their learned discussions in such places. This spirit of open, intellectual debate earned coffee shops the nickname “penny universities“. 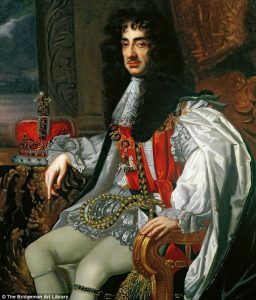 By the time the monarchy was restored under Charles II (Charles I’s son) in 1660, there were as many as 63 coffeehouses in London. However, convinced that coffee shops were hotbeds for sedition and plots, King Charles II decided to close them down in December 1675, a move that caused great public outcry. The opposition was so strong that it caused the king to backtrack after only 11 days. To save face, the king allowed coffee shops to stay open for six more months if their owners paid a hefty sum and swore an oath of allegiance. These conditions were by and large ignored, however. The coffee shops stayed open, and the customers continued to gossip and chat. 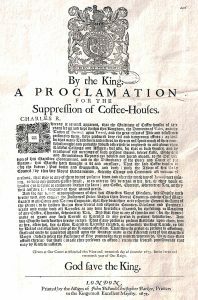 Whereas it is most apparent, that the Multitude of Coffee-Houses of late years set up and kept within this Kingdom, the Dominion of Wales, and the Town of Berwick upon Tweed, and the great resort of Jdle and disaffected persons to them, have produced very evil and dangerous effects; as well for that many Tradesmen and others, do therein mis-spend much of their time, which might and probably would otherwise be imployed in and about their Lawful Callings and Affairs; but also, for that in such Houses, and by occasion of the meetings of such persons therein, diverse False, Malitious and Scandalous Reports are devised and spread abroad, to the Defamation of His Majesties Government, and to the Disturbance of the Peace and Quiet of the Realm; His Majesty hath thought it fit and necessary, That the said Coffee-houses be (for the future) Put down and Suppressed, and doth (with the Advice of His Privy Council) by this His Royal Proclamation, Strictly Charge and Command all manner of persons, That they or any of them do not presume from and after the Tenth Day of January next ensuing, to keep any Publick Coffee-house, or to Utter or sell by retail, in his, her or their house or houses (to be spent or consumed within the same) any Coffee, Chocolet, Sherbett or Tea, as they will answer the contrary at their utmost perils. And for the better accomplishment of this his Majesties Royal Pleasure, His Majesty doth hereby will and require the Justices of Peace within their several Counties, and the Chief Magistrates in all Cities and Towns Corporate, that they do at their next respective General Sessions of the peace (to be holden within their several and respective Counties, Divisions and Precincts) recall and make void all Licences at any time heretofore Granted, for the selling or Retailing of any Coffee, Chocolet, Sherbett or Tea. And that they or any of them do not (for the future) make or grant any such License or Licenses, to any person or persons whatsoever. And his Majesty doth further hereby declare, that if any person or persons shall take upon them, him or her, after his, her or their License or Licenses recalled, or otherwise without License, to sell by retail (as aforesaid) any of the Liquors aforesaid, that then the person or persons so Offending, shall not only be proceeded against, upon the Statute made in the Fifteenth year of his Majesties Reign (which gives the forfeiture of five pounds for every moneth wherein he, she or they shall offend therein) but shall (in case they persevere to Offend) receive the severest punishments that may by Law be inflicted. Given at Our Court at Whitehall, this Nine and twentieth day of December 1675. in the Seven and twentieth year of Our Reign. Printers to the Kings most Excellent Majesty, 1675.